Since I haven’t posted in a bit, I assume most of you have drawn the perfectly logical conclusion that the house is alive and tried to kill us. In support of that theory, let me share a short anecdote. There we are, in the house at midnight, because after seeing “Dawn of the Planet of the Apes”, followed by a trip to the diner, checking out the floors under the newly pulled carpet seemed like a really good idea. Particularly considering two of the three rooms that we needed to look at don’t have lights. Naturally, we’re just about done when we hear a bang of some sort. It’s clearly coming from either the basement or the room right over the basement, but it’s sure not the furnace, because that’s in the laundry pit. I mean, I suppose it could be the old, unhooked furnace in the crawlspace coming back to life. Or a former owner, who didn’t get the memo you need to move out when you die. Of course, I instantly wanted to know if I was the only one who heard the noise, because I’ve been told I have an “overactive imagination” (aka: not everyone has ghost-hearing abilities), but my fiancé heard it too. Naturally, he said something super helpful like “Well, you’ve been saying you wanted a ghost”, or “I thought you said no one died in here”, or “Why don’t you go down to the basement and check?” Something like that. Clearly, I wasn’t going to go down to the basement. And I didn’t want my fiancé to go, because it felt sort of tacky to ask him for the car keys first in case he didn’t come back upstairs. So like many things in the house, we ended up tabling the investigation for another time. “Blah blah blah, when is she going to show us pictures of the floor?”, you’re probably all saying. So here you go. Let’s talk about the front room for a second. 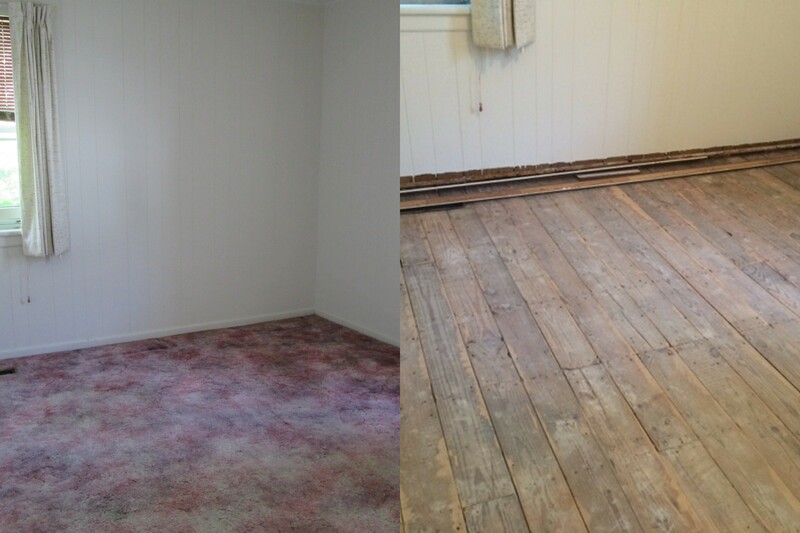 The carpet was clearly chosen without regard to the door and closet door, because they couldn’t be opened or closed once the carpet was in. 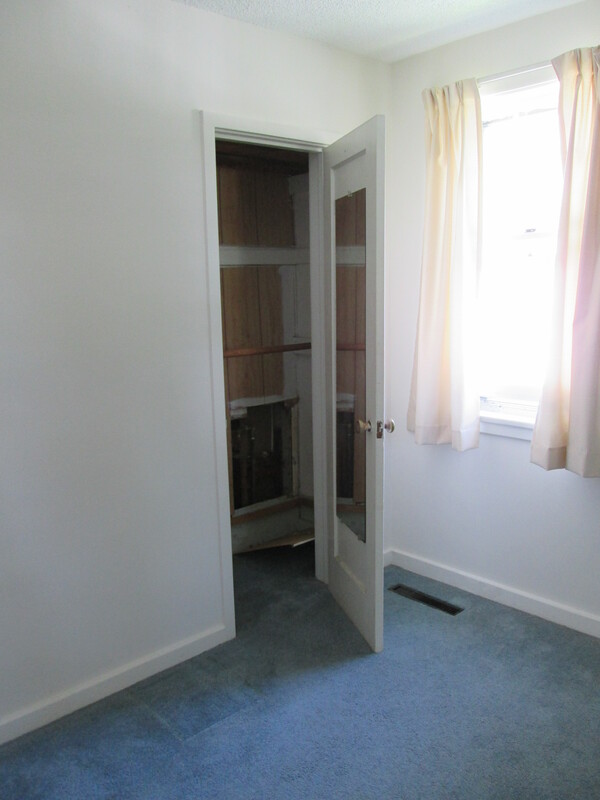 Apparently the previous owner never needed to open or shut his closet door, since it appears to have remained in the same position for years. However, attempts were made to shut the door to the actual room. 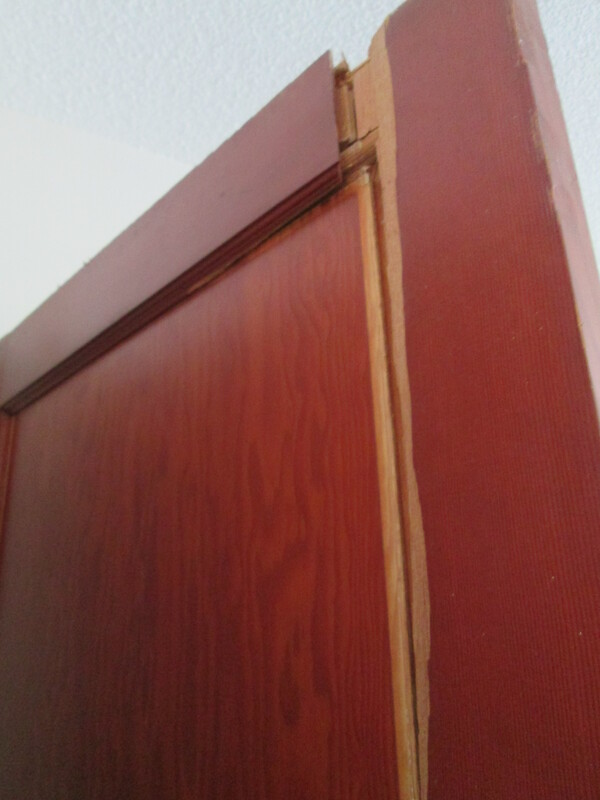 At no point in time did someone say “Hey, maybe we should sand down the bottom of this door so it can open and shut with ease.” Instead, brute (and unsuccessful) force was used to try to open and shut it. 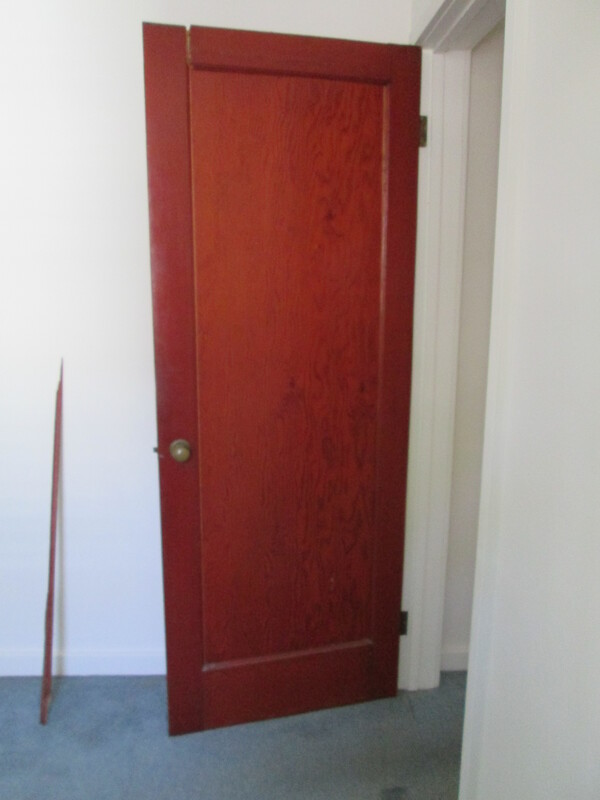 Here is the rest of the door sitting next to the door. The good news is that the doors now swing freely. The bad news is the floor. 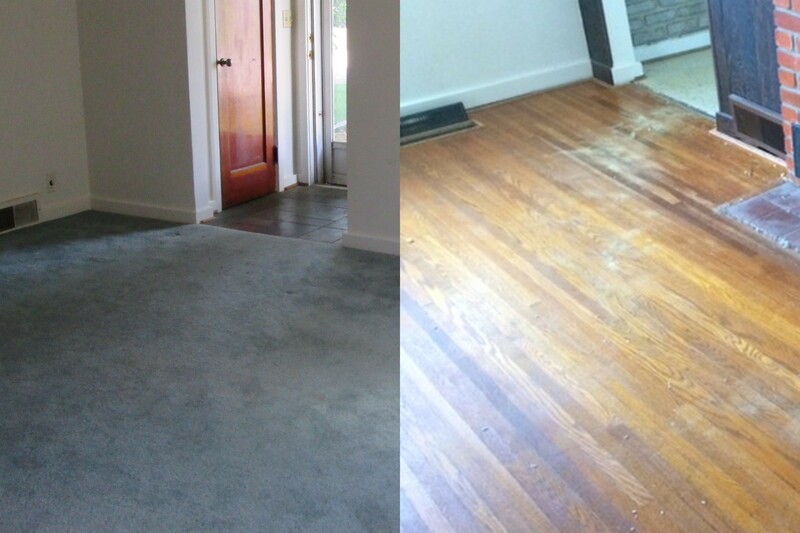 The contractor’s best guess was that someone once glued an indoor/outdoor carpet on the floor, because hey, why not? Finally, the living room. And this floor? 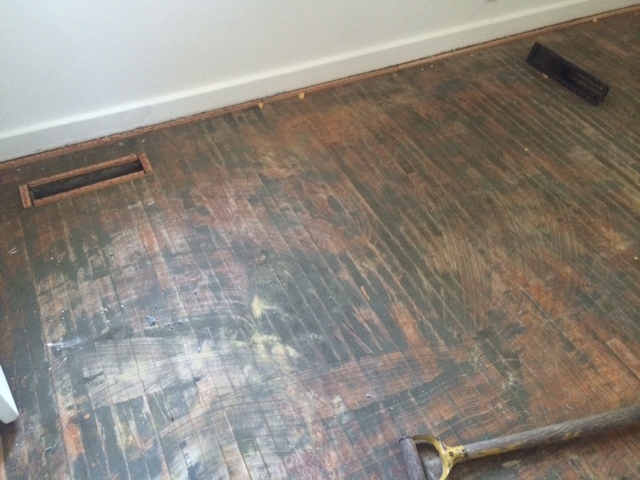 This floor was just fine.